MANILA, Philippines–Boxing champion and Sarangani Rep. Manny Pacquiao showed up for work at the House of Representatives only four days last year. Negros Occidental Rep. Julio Ledesma IV was a bit better—the records showed he attended the session seven times. The two congressmen were the top absentees in the chamber, each with a total attendance of seven, according to official records posted on the House’s website. Pacquiao, also a part-time actor, singer and basketball coach, was actually present in only four session days but he was “deemed present”—meaning his absence was excused—for three days. He spent 25 days on “constituency work” and registered two unexcused absences, based on the records. The boxing hero had two fights last year, the first against Timothy Bradley in April and against Chris Algieri in November. The Filipino won both fights by a unanimous decision. On the other hand, Ledesma, a third-termer, was physically present only seven days, doing constituency work for 14 days. He was listed as absent without leave for 13 other days. The attendance of two representatives under house or hospital arrest was left blank: Former President and now Pampanga Rep. Gloria Macapagal-Arroyo and Lanao del Norte Rep. Abdullah Dimaporo. Arroyo has been under hospital arrest in Quezon City since October 2012 in connection with a plunder complaint against her involving alleged misuse of state lottery funds. She has not attended any session in the current 16th Congress. 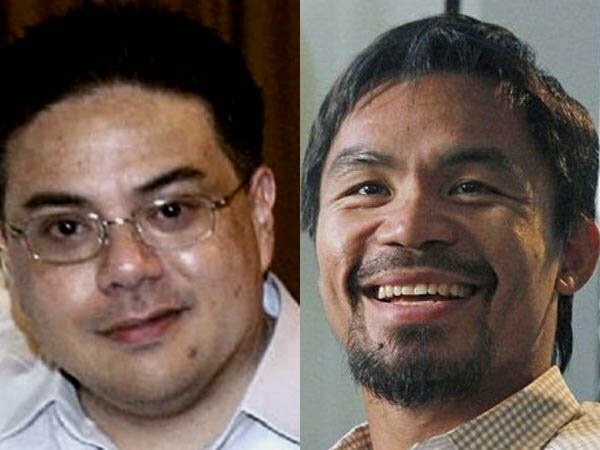 Dimaporo, on the other hand, has been under hospital arrest since August 2013 while facing charges of malversation for the alleged fictitious purchase and delivery of P5 million worth of fertilizer through a nongovernment organization in 2004. Only 65 lawmakers out of 290, led by Speaker Feliciano Belmonte Jr., posted a perfect attendance of 34 session days from Jan. 20 to Dec. 17, 2014. There were actually 70 session days but the roll was called in only half of that time to dispense with the need for a quorum. In the past, the House journal service counted the days when there was no roll call (when all members were considered present), resulting in skewed attendance numbers. For instance, the records at one point showed Arroyo and Dimaporo—who were supposedly under hospital arrest—being present during certain days. Low attendance was a cause of problem in the House last year as the chamber needed to pass a number of priority measures, chief of which was the P2.6-trillion national budget for 2015. In the last quarter, as House leaders were scrambling to enact the budget, low numbers threatened to derail its approval as opposition lawmakers questioned the quorum on the plenary floor. Other top absentees included Camarines Sur Rep. Rolando Andaya Jr. with an attendance record of 10, Iloilo Rep. Hernan Biron Jr. with 11 and Leyte Rep. Lucy Torres-Gomez with 15. Abang Lingkod Rep. Joseph Stephen Paduano also registered an attendance of 15 days, but he was sworn in only in May.